So, last blog I waxed lyrical and briefly about the history of the Castle. ‘Briefly’ because, although its been around a long time, it hasn’t had much excitement. This is probably a good thing if you happened to have lived there. But it doesn’t make a good story and could be classed as a bit boring. Boring it may have been but what did it look like? It was a ‘motte and bailey’ structure. That’s a French thing. 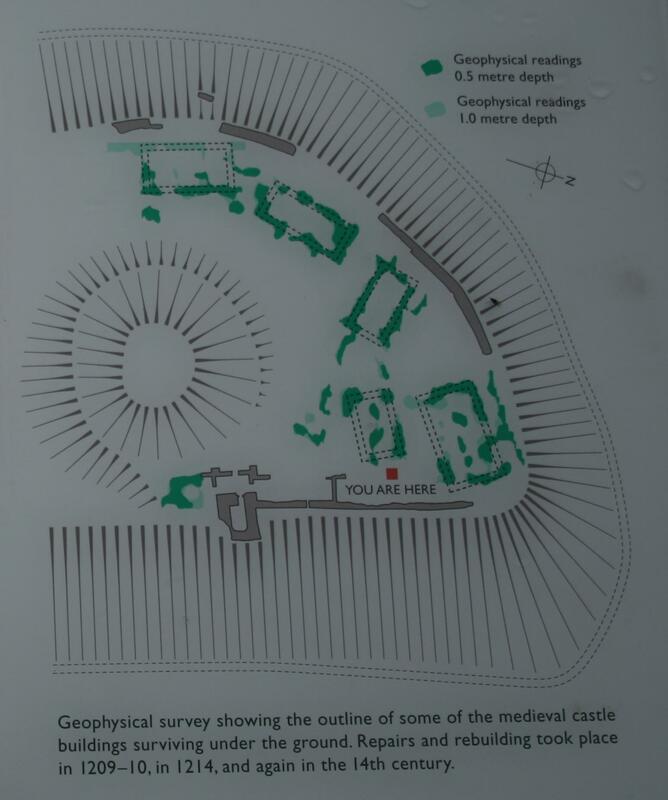 The motte, now the tree covered mound in the middle of the site (well sort of middle), would have been the location of the wooden dwelling of the baron (initially William de Braose if you remember last blog). The bailey is the flat grass area around it. How do we know this? Well, the great lump in the middle of the castle grounds is not the result of giant moles so it’s a bit obvious. 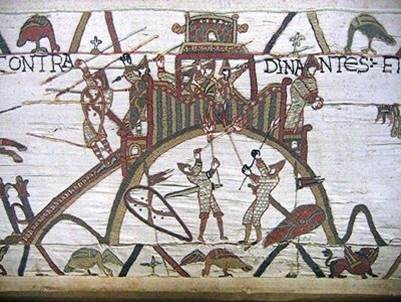 Also the Bayeux Tapestry gives us an indication of what such a castle motte may have looked like. 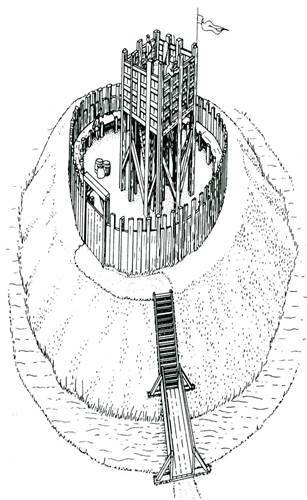 See pic below – the wooden structure on top of the motte mound is being defended and it has a ditch around it (see pic further below for what the Bramber motte may have looked like). 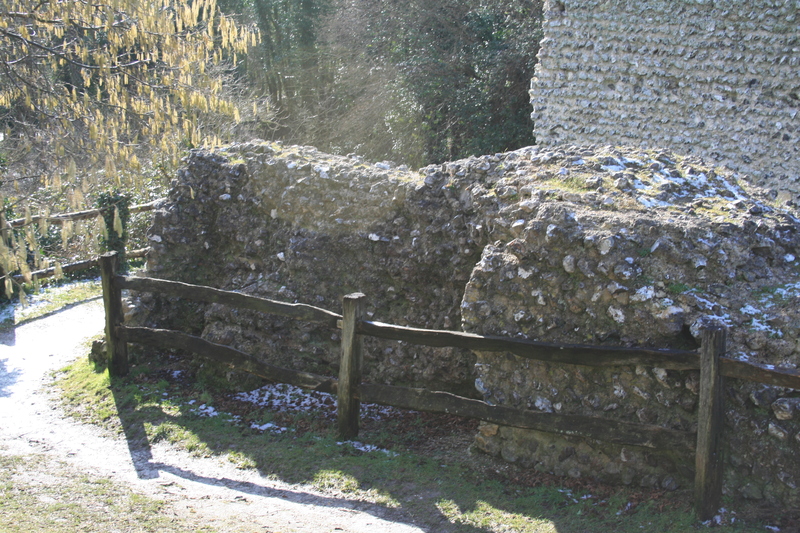 There is archaeological evidence that Bramber motte once had a ditch around it. The main excavation of the Castle’s gatehouse, curtain wall, motte ditch and sections of the bailey was carried out by K.J. Barton and E.W. Holden in 1966-67. 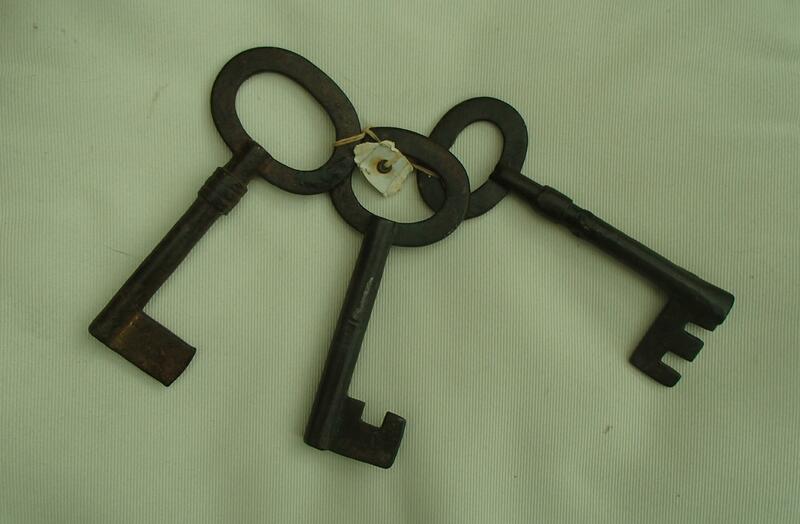 A great many finds were uncovered, some dating back to the 11th century. They included various types of pottery, bronze tools, iron arrowheads, horse fittings, buckles, clay pipes and 917 fragments of animal bones were identified. What is, perhaps, equally interesting (so as to make it not too boring – see above) is what was not found. As mentioned in the previous blog, it was generally believed that an explosion, in a skirmish during the Civil War, destroyed the Castle. However, Barton & Holden report that no traces of Cromwellian destruction were recovered. Admittedly, this does not mean it definitely did not happen – but why blow up something that is already a ruin? (I know, the Venetians blew up the ruins of the Parthenon on the Athenian Acropolis because the Ottomans used it an ammunition store …. but that’s another story). 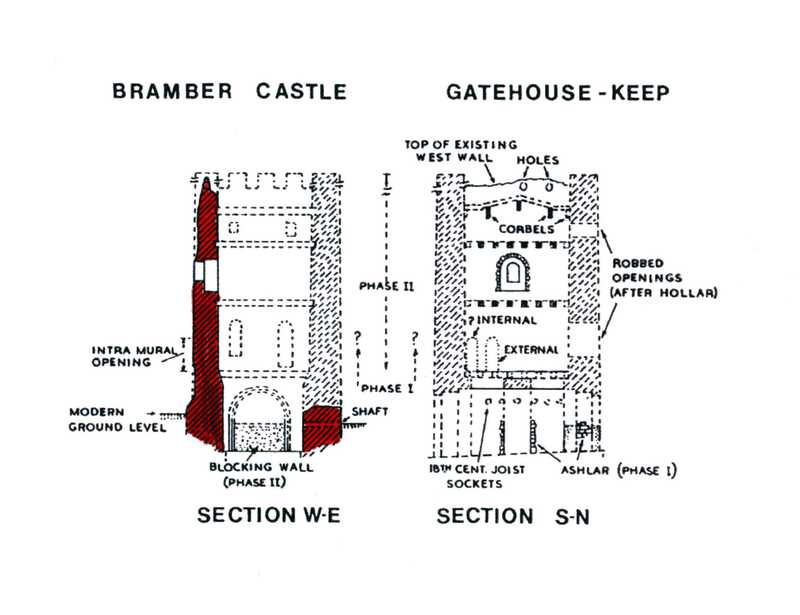 However, the keep or gatehouse to the Castle (stonework to the right of the steps) appears to have been built in two phases. Firstly, in the 11th century (c.1075), it was simply a gatehouse about 38 ft in height, 9ft thick and consisting of a north and south gate. This would have been the main entrance. Secondly, during the 12th century, possibly Philip de Braose, or his son William, said, “I want it BIGGER”. It was transformed into a tower in excess of 50 feet in height (as it – well, the west wall – is today). The south gate was blocked up (to make it more secure from invaders) and the north gate half blocked by a blocking wall. The internal ground floor was filled to the top of this blocking wall (the depth of the floor is about 10 feet below the present ground level). The entrance to the keep would have been from this north side but also by an intra-mural opening to the side of the west wall (still standing – see photo below). There was a semi-circular stone base beneath this opening, perhaps indicating the base to the stairway to the entrance. The main entrance to the Castle moved to the curtain wall west of the keep, in line with the present entrance and moat ‘bridge’. It is likely that the moat would have been dry except the lower east side. There is evidence of two ovens adjacent to the outside of the west wall indicating that some building structure existed albeit for only a short period of time (due to lack of evidence of repairs). Oven 1 (to the north) had an easterly opening close to the keep wall. Oven 2 had an ashened westerly opening but a clean northerly one – the draw hole. Pottery associated with these ovens was 12th century. Oyster shells and a pit (tank) were found immediately to the north of the keep. Exciting isn’t it …..? The south wall of the keep collapsed into the moat in or about the 16th century due to erosion of its foundations (some of it is still there) whereas the north wall and the east wall suffered flint and stone robbing. On the external side of the east stub wall of the keep is a fireplace and a curving stairway. Late in the 17th century, early 18th, timber buildings were constructed to the east of this stub wall. These were temporary humbled dwellings. To the east of the motte are the remains of a 13th/14th century domestic building. The entrance from a courtyard to the east (below the mound) led into a central chamber or hall (see very first plan above). 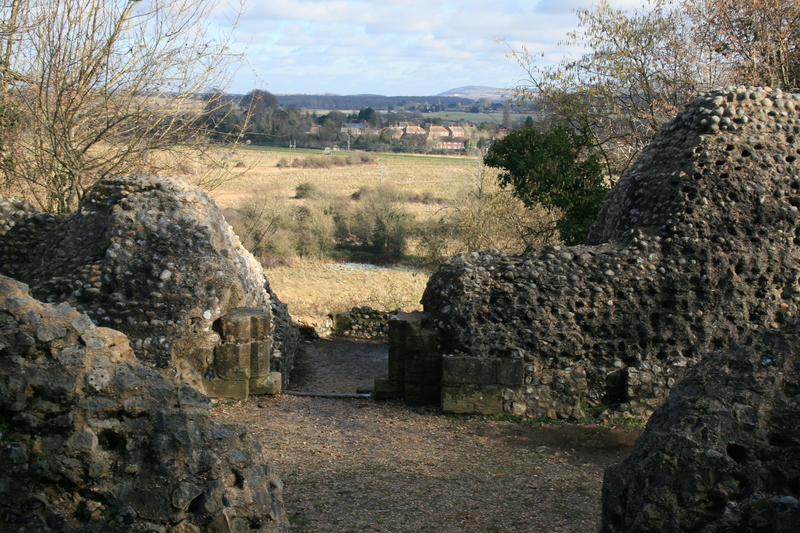 To the right there was possibly a guardroom; directly in front of the entrance steps lead to perhaps a chapel and semi-circular lookout area (photo below). To the left of the entrance is the kitchen area with two fireplaces and an oven (please don’t try cooking there today). Possibly a guardroom – get that view! South of the motte evidence of temporary wooden structures was found along with a hearth, iron and bronze waste, nails and slag indicating a smithing area and workshop during the 14th century. South of the workshop were two lime kilns, again 14th century but probably after the workshop ceased to function. The lack of structure indicates temporary use and probably erected for repair work to the Castle. 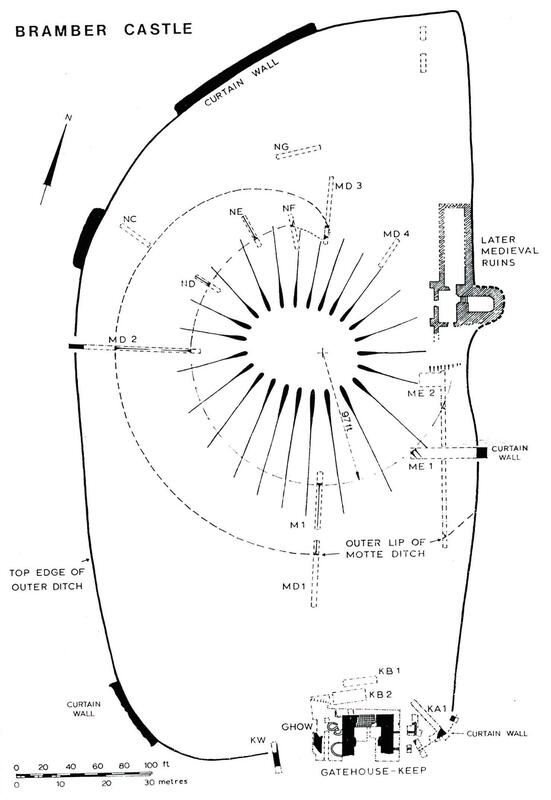 However, around the north end of the motte, geophysics has shown foundations of several buildings (pic below). Busy place once upon a time. 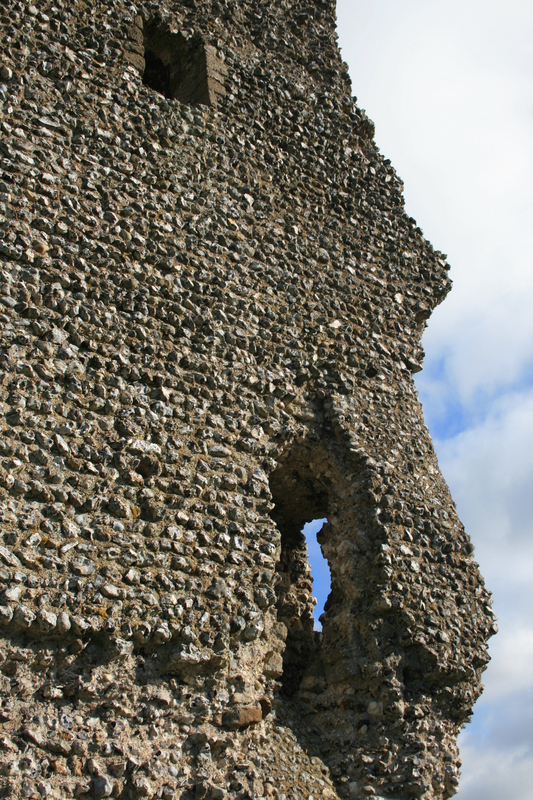 And that’s Bramber Castle in a nutshell! Not boring at all ……. Coming soon: St Nicholas’ Church (Bramber Castle); Ghosts of Bramber Castle; St Mary’s, Bramber. (Good old Bramber! ).